An in-depth report on the causes, diagnosis, treatment, and prevention of shingles and chickenpox. Children ages 12 months to 13 years. All healthy children should receive their first chickenpox vaccination at age 12 to 15 months and a second vaccination at age 4 to 6 years (preferably before entering pre-kindergarten, kindergarten, or first grade). Adolescents and Adults ages 13 years and older. All healthy teenagers and adults who have never had chickenpox or the vaccine should receive 2 doses of the varicella vaccine, given 4 weeks apart. The shingles (herpes zoster) vaccine (Zostavax) is FDA-approved for adults age 50 years and older with healthy immune systems. However, the CDC recommends adults 60 and older get the shingles vaccine. The CDC has not yet added the shingles vaccine to its list of recommended vaccines for adults ages 50 to 59. However, people ages 50 to 59 who suffer from chronic pain or chronic skin conditions would be encouraged to not wait until they are 60 to receive the vaccine, as would persons who are receiving certain milder forms of immunosuppressive therapy. There is no maximum age for getting the vaccine. Chickenpox is uncomfortable and unpleasant, but most cases are relatively mild and resolve within 7 to 10 days. 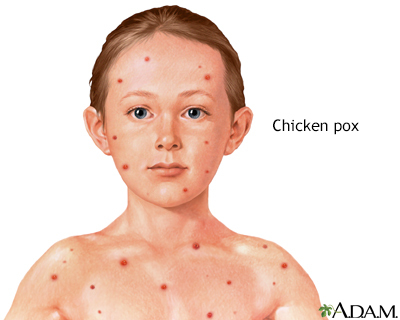 If you or your child has been exposed to chickenpox, contact your health care provider. In otherwise healthy people who have a low risk for complications, home remedies can help provide relief from itching and fever. Oatmeal baths can help relieve itching. Calamine lotion can help dry out blisters and soothe skin. Acetaminophen (Tylenol, generic) can help reduce fever. Antihistamines may relieve severe itching and aid sleep. Most important, do not scratch! Scratching the blisters can cause scarring and lead to a secondary infection. Varicella, or chickenpox, develops after an individual is exposed to VZV for the first time. Herpes zoster, or shingles, develops from reactivation of the virus later in life, usually many decades after chickenpox. Shingles is also called herpes zoster due to the shape of its characteristic skin eruption ("herpein" means "to creep" in Greek). Most people get chickenpox from exposure to other people with chickenpox. The varicella virus is most often spread through sneezing, coughing, and breathing. It is so contagious that few non-immunized people escape chickenpox when they are exposed to someone with the disease. When people with chickenpox cough or sneeze, they expel tiny droplets that carry the varicella virus. If a person who has never had chickenpox or never been vaccinated inhales these particles, the virus enters the lungs. From here it passes into the bloodstream. When it is carried to the skin it produces the typical rash of chickenpox. Symptoms range from fever, headache, stomach ache, or loss of appetite before breaking out in the classic pox rash. The rash can consist of several hundred small, itchy, fluid-filled blisters over red spots on the skin. The blisters often appear first on the face, trunk, or scalp and then spread to other parts of the body. People can also catch chickenpox from direct contact with a shingles rash if they have not been immunized by vaccination or by a previous bout of chickenpox. In such cases, transmission happens during the active phase when blisters have erupted but have not formed dry crusts. A person with shingles cannot transmit the virus by breathing or coughing. During a bout of chickenpox, the varicella-zoster virus travels to nerve cells in the dorsal root ganglia near the spinal cord. These are bundles of nerves that transmit sensory information from the skin to the brain. In the dorsal root ganglia, the virus can hide from the immune system and remain inactive but alive for years, often for a lifetime. This period of inactivity is called latency. If the virus becomes active after being latent, it causes the disorder known as shingles, or herpes zoster. The virus spreads in the ganglion and to the nerves connecting to it. Nerves most often affected are those in the face or the trunk. The virus can also spread to the spinal cord and into the bloodstream. Shingles can develop only from a reactivation of the varicella-zoster virus in a person who has previously had chickenpox. People who are older or who have weakened immune system are most vulnerable. Shingles cannot be transmitted from one person to another either through the air or through direct exposure to the blisters. However, exposure to the rash in the blister phase can lead to chickenpox in susceptible people. The varicella-zoster virus belongs to a group of herpes viruses that includes 9 viruses that cause human disease (as well as more than 130 strains that can infect various animals). Herpes viruses are similar in shape and size and reproduce within the structure of a cell. The particular cell depends upon the specific virus. Human herpes viruses include herpes simplex virus 1 (HSV-1), which usually causes cold sores, and herpes simplex virus 2 (HSV-2), which usually causes genital herpes. Cytomegalovirus (CMV), which causes mononucleosis-like illness and retinitis, and Epstein-Barr Virus (EBV), the cause of classic mononucleosis, are also human herpes viruses. All herpes viruses share some common properties, including a pattern of active symptoms followed by latent inactive periods that can last for months, years, or even a lifetime. Chickenpox typically strikes children under 10 years of age. Since the introduction of the chickenpox (varicella) vaccine in 1995, the number of chickenpox cases has dramatically declined. Chickenpox usually occurs in late winter and early spring months. It is typically airborne transmitted, but it can also be transmitted from direct contact with the open blisters associated with either chickenpox or shingles. A person with chickenpox can transmit the disease from about 2 days before the appearance of the spots until the end of the blister stage. This period lasts about 5 to 7 days. Once dry scabs form, the disease is unlikely to spread. Recurrence of chickenpox is possible, but uncommon. One episode of chickenpox usually means lifelong immunity against a second attack. However, people who have had mild infections may be at greater risk for a breakthrough, and more severe, infection later on particularly if the outbreak occurs in adulthood. Anyone who has had chickenpox is at risk for shingles later in life. Certain factors increase the risk for such outbreaks. The risk for herpes zoster increases as people age. The risk for postherpetic neuralgia (PHN) also increases after age 50. PHN is persistent nerve pain and is the most common severe complication of shingles. Immune suppressing drugs used for treating autoimmune conditions such as rheumatoid arthritis, lupus, Crohn disease, and ulcerative colitis. These medications include disease-modifying anti-rheumatic drugs (DMARDs), steroids, and biologic drugs such as tumor necrosis factor (TNF) inhibitors. Current guidelines recommend against herpes zoster vaccination for people with weakened immune systems. However, some research suggests that vaccination may be safe for people with autoimmune disorders and those who take immunosuppressant drugs. Although it is most common in adults, shingles occasionally develops in children. Children with immune deficiencies are at highest risk. Children with no immune problems who had chickenpox before they were 1-year-old also have a higher risk for shingles. Shingles can recur, but the risk is low. Evidence suggests that a first zoster episode may boost the immune system to ward off another attack. However, people who had long-lasting shingles pain after their first episode, and people who are immunocompromised, may be at higher risk for recurrence. Chickenpox (varicella) rarely causes complications, but it is not always harmless. It can cause hospitalization and, in rare cases, death. The major long-term complication of varicella is the later reactivation of the herpes zoster virus and the development of shingles. People with impaired immune systems due to diseases (such as Hodgkin disease) or cancer treatments (chemotherapy, bone marrow, or stem cell transplants) are at higher risk for chickenpox complications. They also have increased risk for herpes zoster and its complications. Pregnant women who get chickenpox have an increased risk for life-threatening pneumonia. Infection during the first trimester or early second trimester may also affect the developing fetus and potentially cause birth defects. If the mother contracts chickenpox during the days following birth, her newborn is at risk for developing a serious varicella infection. Shingles is extremely rare in pregnant women. Aside from itching, the complications described below are usually rare. In some cases, a secondary bacterial infection may develop at sites that were scratched. If the skin around the scab becomes red, swollen, or warm, this may be a sign of a secondary bacterial infection. If you or your child develops these symptoms contact your health care provider because in rare cases, serious bacterial complications can occur. Varicella pneumonia is an uncommon but serious complication of chickenpox. It usually develops 1 to 6 days after the chickenpox rash appears. Fever and cough may be signs of varicella pneumonia. Pregnant women, people who are immunocompromised, and smokers are at increased risk for this lung complication. In encephalitis, seizures and coma can occur. Meningitis and encephalitis are very serious conditions that require immediate medical treatment. Reye syndrome, a disorder that causes sudden and dangerous liver and brain damage, is a side effect of aspirin therapy in children who have chickenpox or influenza. The disease can lead to coma and is life threatening. Symptoms include rash, vomiting, and confusion beginning about a week after the onset of the disease. Children should never take aspirin when they have a viral infection or fever. Acetaminophen (Tylenol, generic) is often given instead for fever or pain in children. Disseminated varicella, which develops when the virus spreads to organs in the body, is extremely serious especially for people with weakened immune systems. Age. PHN usually affects people with herpes zoster who are over 60 years old. The older a person is the longer PHN is likely to last. It rarely occurs in people under age 40. Gender. Some studies suggest that women may be at slightly higher risk for PHN than men. Severe or complicated shingles. People who had prodromal symptoms or a severe attack (numerous blisters and severe pain) during the initial shingles episode are also at high risk for PHN. People whose eyes have been affected also have increased risk for PHN. If the blistered area is not kept clean and free from irritation, it may become infected with group A Streptococcus or Staphylococcus bacteria. If the infection is severe, scarring can occur. In very rare cases, herpes zoster is associated with Stevens-Johnson syndrome, an extensive and serious condition in which widespread blisters cover mucous membranes and large areas of the body. If shingles occurs in the face, the eyes are at risk, particularly if the path of the infection follows the side of the nose. If the eyes become involved (herpes zoster ophthalmicus), a severe infection can occur that is difficult to treat and can threaten vision. People with HIV/AIDS may be at particular risk for a chronic infection in the cornea of the eye. Herpes zoster can also cause a severe infection in the retina called acute retinal necrosis syndrome. In such cases, visual loss can develop. Although this complication usually follows a herpes outbreak in the face, it can occur after an outbreak in any part of the body. Guillain-Barré Syndrome. Guillain-Barré syndrome is caused by the inflammation of the nerves and is associated with a number of viruses, including herpes zoster. The arms and legs become weak, painful, and, sometimes, even paralyzed. The trunk and face may be affected, including breathing. Symptoms vary from mild to severe enough to require hospitalization. The disorder typically resolves in a few weeks to months. Other herpes viruses (cytomegalovirus and Epstein-Barr), or bacteria (Campylobacter) may have a stronger association with this syndrome than herpes zoster. Ramsay Hunt Syndrome. Ramsay Hunt syndrome occurs when herpes zoster causes facial paralysis and rash on the ear (herpes zoster oticus) or in the mouth. Symptoms include severe ear pain and hearing loss, ringing in the ear, loss of taste, nausea, vomiting, and dizziness. Ramsay Hunt syndrome may also cause a mild inflammation in the brain. The dizziness may last for a few days, or even weeks, but usually resolves. Severe or partial hearing loss may occur but this too is usually temporary. Facial paralysis, on the other hand, may be permanent. Bell Palsy. Bell palsy is a partial paralysis of the face often caused by damage to a facial nerve. Sometimes, it is difficult to distinguish between Bell palsy and Ramsay Hunt syndrome, particularly in the early stages. In general, Ramsay Hunt syndrome tends to be more severe than Bell palsy. Meningitis and Encephalitis. Inflammation of the membrane around the brain (meningitis) or in the brain itself (encephalitis) is an uncommon complication in people with herpes zoster. The encephalitis is generally mild and resolves in a short period. In rare cases, particularly in people with impaired immune systems, it can be severe and even life threatening. Vascular Complications. Some research suggests that herpes zoster may increase the risk for transient ischemia attack (TIA), stroke, or possibly heart attack in the first weeks or months following a shingles outbreak. Antiviral drugs may be protective. As with disseminated chickenpox, disseminated herpes zoster, which can spread to other organs, can be serious to life-threatening, particularly if it affects the lungs. People with compromised immune systems are at greatest danger. It is very rare in people with healthy immune systems. The time between exposure to the virus and eruption of symptoms is called the incubation period. For chickenpox, this period is 10 to 20 days. Fever, headache, swollen glands, and other flu-like symptoms often develop before the typical rash appears. Fevers are low grade in most children. However, some fevers can reach 105°F (40.5°C). These symptoms subside once the rash breaks out. One or more tiny raised red bumps appear first, most often on the face, chest, or abdomen. They become larger within a few hours and spread quickly (sprout), eventually forming small blisters on a red base. The numbers of blisters vary widely. Some people have only a few spots, others can develop hundreds. Each blister is filled with clear fluid that becomes cloudy in several days. It takes about 4 days for each blister to dry out and form a scab. During its course, the rash itches, sometimes severely. Usually separate crops of blisters occur over 4 to 7 days, the entire disease process lasting 7 to 10 days. In the prodrome phase, a cluster of warning symptoms appear 3 to 4 days before the outbreak of the infection. These symptoms can range from general feelings of malaise (chills, fever, nausea, and muscle aches) to abnormal sensations such as tingling, itching, burning, or a feeling of "pins and needles" accompanied by deep pain. The skin may be unbearably sensitive to touch. After prodrome, a rash appears, usually on the trunk. However, the rash can develop in other areas as well, such as legs, arms, face, or neck. The rash is typically confined to one side of the body and follows the same track of inflamed nerves as the prodrome pain. The rash usually starts as well-defined, small, red clear spots. Within 12 to 24 hours, these pimples develop into small fluid-filled blisters. The blisters grow, merge, and become pus-filled, and are extremely painful. Within about 7 to 10 days (as with chickenpox), the blisters form crusts and heal. In some cases it may take as long as a month before the skin clears completely. Sometimes pain develops without a rash, a condition known as zoster sine herpete. 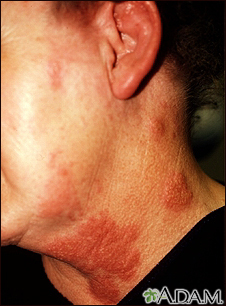 This is a picture of herpes zoster (shingles) on the neck and cheek. The same virus that causes chickenpox is responsible for outbreaks of shingles. Outbreaks of shingles often follow the distribution of nerves in the skin. This distribution pattern is called a dermatome (see the "dermatomes" picture). Both chickenpox (varicella) and shingles (zoster) can usually be diagnosed by symptoms alone. If a diagnosis is still unclear after a physical examination, laboratory diagnostic tests may be required. These tests use samples of fluid taken from the blister. They are generally used to distinguish between varicella-zoster and herpes simplex viruses. Chickenpox, particularly in early stages, may be confused with herpes simplex, impetigo, insect bites, or scabies. The early prodrome stage of shingles can cause severe pain on one side of the lower back, chest, or abdomen before the rash appears. It may be mistaken for other disorders, such as gallstones, that cause acute pain in internal organs. In the active rash stage, shingles may be confused with herpes simplex, particularly in young adults, if the blisters occur on the buttocks or around the mouth. Herpes simplex, however, does not usually generate chronic pain. A diagnosis may be difficult if herpes zoster takes a non-typical course in the face, such as with Bell palsy or Ramsay Hunt syndrome, or if it affects the eye or causes fever and delirium. The live-virus varicella vaccine (Varivax) produces persistent immunity against chickenpox. The vaccine can prevent chickenpox or reduce the severity of the illness if it is used within 3 days, and possibly up to 5 days, after exposure to the infection. The childhood chickenpox vaccine can also be given as part of a combination vaccine (ProQuad) that combines measles, mumps, rubella (together called MMR), and varicella in one product. However, the CDC advises that combining varicella and MMR vaccinations into one shot doubles the risk for febrile (fever-related) seizures in children ages 12 to 23 months compared to giving separate MMR and varicella injections. The combination varicella and MMR vaccine is usually recommended for the second dose, in children ages 4 to 6 years, as it is not associated with an increased risk for febrile seizures in this age group. Children who are at higher risk for seizures due to a personal or family medical history should generally receive the MMR and varicella vaccines separately. For children who have previously received one dose of the chickenpox vaccine, the ACIP recommends that they receive a "catch-up" second dose during their regular doctor's visit. This second dose can be given at any time as long as it is at least 3 months after the first dose. Studies indicate that the odds of developing chickenpox are significantly lower in children who receive two doses of the vaccine compared to those who receive only one. Children most at risk for having chickenpox after having been vaccinated only one time are ages 8 to 12 years and have generally been vaccinated at least 5 years before their current chickenpox infection. People who have had previous allergic reactions to gelatin or the antibiotic neomycin should talk with their healthcare provider concerning the vaccine. People who cannot be vaccinated but who are exposed to chickenpox receive immune globulin antibodies against varicella virus. This helps prevent complications of the disease if they become infected. Most side effects are mild and include pain at the injection site and a low-grade fever. Rarely, fever-related seizure or pneumonia may occur. In rare cases, the vaccine may produce a mild rash within about a month of the vaccination, which can transmit chickenpox to others. Individuals who have recently been vaccinated should avoid close contact with anyone who might be susceptible to severe complications from chickenpox until the risk for a rash passes. The herpes zoster (shingles) vaccine (Zostavax) was originally approved for adults ages 60 years and older. In 2011, the FDA lowered the approved age for Zostavax to 50. Because the vaccine contains live virus, it is not recommended for people with weakened immune systems. Although the shingles vaccine is approved for adults age 50 and older, the CDC still recommends it for routine use in those ages 60 and older. There is no maximum age for getting the vaccine. A single shot of the vaccine can halve the risk of developing shingles and may also help prevent postherpetic neuralgia and ophthalmic herpes. It is not yet clear how long immunity lasts or if people may eventually require a booster shot. Hospitalized premature infants (born at = 28 weeks) whose mothers do not have evidence of immunity. Hospitalized premature infants (born at < 28 weeks) even if their mothers have been immunized previously. For these people, VariZIG should be given within 10 days of exposure to someone with chickenpox (the earlier the better). People with chickenpox do not have to stay in bed unless fever and flu symptoms are severe. To relieve discomfort, a child can take acetaminophen (Tylenol), with doses determined by the doctor. A child should never be given aspirin, or medications containing aspirin, as aspirin increases the risk for a dangerous condition called Reye syndrome. Frequent baths are particularly helpful in relieving itching, when used with preparations of finely ground (colloidal) oatmeal. Commercial preparations (Aveeno) are available in drugstores, or can be made at home by grinding or blending dry oatmeal into a fine powder. Use about 2 cups per bath. The oatmeal will not dissolve, and the water will have a scum. Adding baking soda to a bath may help relieve severe itching. Applying calamine lotion and similar over-the-counter preparations to the blisters to help dry them out and soothe the skin. For severe itching, diphenhydramine (Benadryl) is useful and may help children sleep. Small children may have to wear mittens so that they do not scratch the blisters and cause a secondary infection. All people with varicella, including adults, should have their nails trimmed short. Acyclovir or similar antiviral drugs may be used for children over age 12 and adults who have a high risk for developing complications and severe forms of chickenpox. It is not commonly prescribed for young children. To be effective, oral acyclovir must be taken within 24 hours of the onset of the rash. Early intravenous administration of acyclovir is an essential treatment for chickenpox-related pneumonia. Valacyclovir and famciclovir are other antiviral drugs that may help treat chickenpox. Over-the-counter (OTC) remedies are often effective in reducing the pain of an attack. Antiviral drugs (acyclovir and others), oral corticosteroids, or both are sometimes given to people with severe symptoms, particularly if they are older and at risk for postherpetic neuralgia (PHN). Cold compresses soaked in Burow's solution (an over-the-counter aluminum triacetate solution) and cool baths may help relieve itching. It is important not to break blisters as this can cause infection. Do not use warm treatments, which can intensify itching. Wear loose clothing and use clean loose gauze coverings over the affected areas. The home treatments to prevent or reduce itching are similar to those used for chickenpox. People can try antihistamines (particularly Benadryl), oatmeal baths, and calamine lotion. Adults may take acetaminophen or nonsteroidal anti-inflammatory drugs (NSAIDs), such as ibuprofen (Advil). These remedies, however, are not very effective for postherpetic neuralgia. Antiviral drugs do not cure shingles, but they can reduce the severity of the attack, hasten healing, and reduce the duration. They may also reduce the risk of postherpetic neuralgia and other complications. Famciclovir (Famvir) and valacyclovir (Valtrex) are sometimes preferred to treat herpes zoster because they require fewer daily doses than acyclovir. Acyclovir may have more side effects than the other two drugs. People who have kidney problems or weakened immune systems may need to take a lower dose of these medications. Foscarnet (Foscavir) is an injectable antiviral drug that can be used to treat cases of varicella-zoster infection resistant to acyclovir and similar drugs. It is rarely necessary. Postherpetic neuralgia (PHN) is difficult to treat. Once PHN develops, a person may need a multidisciplinary approach that involves a pain specialist, primary care physician, and other health care providers. Lidocaine. A patch that contains the anesthetic lidocaine (Lidoderm) is approved specifically for postherpetic neuralgia (PHN). Another patch (EMLA) contains both lidocaine and prilocaine, a second anesthetic. The most common side effects are skin redness or rash. Capsaicin. Capsaicin is a chemical compound found in hot chili peppers. A prescription capsaicin skin patch (Qutenza) is approved for pain relief of PHN. The patch must be applied by a health care professional, as placement of the patch can be painful. Because the patch may increase blood pressure, the person should be monitored for at least 1 hour after the patch is applied. A lower-concentration ointment form of capsaicin (Zostrix) is available over the counter, but its benefits may be limited. Topical Aspirin. Topical aspirin, known chemically as trolamine salicylate (Aspercreme), may bring relief. Menthol-Containing Preparations. Topical gels containing menthol, such as high-strength Flexall 454, may be helpful. Tricyclic antidepressants may help relieve PHN pain. Nortriptyline (Pamelor), amitriptyline (Elavil), and desipramine (Norpramin) are some standard tricyclic drugs used for treating PHN. It may take several weeks for the drugs to become fully effective. They do not work as well in people who have burning pain or allodynia (pain that occurs with normally non-painful stimulus, such as a light touch or wind). Anticonvulsant medications may increase the risk of suicidal thoughts and behavior. People with severe pain that does not respond to tricyclic antidepressants or anticonvulsants may need powerful painkilling opioid drugs. The use of narcotics for PHN is controversial as these drugs can beare highly addictive. The long-term benefits of opioid use to manage PHN are unclear. Patients under opioid treatment should be closely monitored. These drugs may be taken by mouth or delivered through a skin patch. Oxycodone is a standard opioid for PHN. Morphine may also be used. Constipation, drowsiness, and dry mouth are common side effects of opioids. Tramadol (Ultram) is a centrally acting pain reliever that is used as the second line of treatment for PHN. It is a weak dual acting opioid agonist. Addictive properties are milder than naturally occurring opioids (morphine); however, dependence and abuse have been reported. Side effects are similar to opioids. Psychotherapy approaches, such as cognitive behavioral therapy, may help people learn how to cope with, and manage, their responses to pain. Certain surgical techniques attempt to block nerve centers associated with postherpetic neuralgia. These methods carry risk and should be considered only when all other methods have failed and the pain is intolerable. Breuer J, Pacou M, Gauthier A, Brown MM. Herpes zoster as a risk factor for stroke and TIA: a retrospective cohort study in the UK. Neurology. 2014;82(3):206-212. PMID: 24384645 www.ncbi.nlm.nih.gov/pubmed/24384645. Centers for Disease Control and Prevention Advisory committee on immunization practices recommended immunization schedule for adults aged 19 years or older - United States, 2017. CDC.gov Web site. www.cdc.gov/mmwr/volumes/66/wr/mm6605e2.htm. Updated August 1, 2017. Accessed August 14, 2017. Centers for Disease Control and Prevention. Advisory committee on immunization practices recommended immunization schedule for children and adolescents aged 18 years or younger - United States, 2017. CDC.gov Web site. www.cdc.gov/mmwr/volumes/66/wr/mm6605e1.htm. Updated August 1, 2017. Accessed August 14, 2017. Cunningham AL, Lal H, Kovac M, et al. Efficacy of the herpes zoster subunit vaccine in adults 70 years of age or older. N Engl J Med. 2016;375(11):1019-1032. PMID: 27626517 www.ncbi.nlm.nih.gov/pubmed/27626517. Gagliardi AM, Andriolo BN, Torloni MR, Soares BG. Vaccines for preventing herpes zoster in older adults. Cochrane Database Syst Rev. 2016;3:CD008858. PMID: 26937872 www.ncbi.nlm.nih.gov/pubmed/26937872. Joesoef RM, Harpaz R, Leung J, Bialek SR. Chronic medical conditions as risk factors for herpes zoster. Mayo Clin Proc. 2012;87(10):961-967. PMID: 23036671 www.ncbi.nlm.nih.gov/pubmed/23036671. Johnson RW, Rice AS. Clinical practice. Postherpetic neuralgia. N Engl J Med. 2014;371(16):1526-1533. PMID: 25317872 www.ncbi.nlm.nih.gov/pubmed/25317872. Lal H, Cunningham AL, Godeaux O, et al. Efficacy of an adjuvanted herpes zoster subunit vaccine in older adults. N Engl J Med. 2015;372(22):2087-2096. PMID: 25916341 www.ncbi.nlm.nih.gov/pubmed/25916341. Langan SM, Minassian C, Smeeth L, Thomas SL. Risk of stroke following herpes zoster: a self-controlled case-series study. Clin Infect Dis. 2014;58(11):1497-1503. PMID: 24700656 www.ncbi.nlm.nih.gov/pubmed/24700656. LaRussa PS, Marin M. Varicella-zoster virus. In: Kliegman RM, Stanton BF, St. Geme JW, Schor NF, eds. Nelson Textbook of Pediatrics. 20th ed. Philadelphia, PA: Elsevier; 2016:chap 253. Schuster AK, Harder BC, Schlichtenbrede FC, Jarczok MN, Tesarz J. Valacyclovir versus acyclovir for the treatment of herpes zoster ophthalmicus in immunocompetent patients. Cochrane Database Syst Rev. 2016;11:CD011503. PMID: 27841441 www.ncbi.nlm.nih.gov/pubmed/27841441. Shapiro ED, Vazquez M, Esposito D, et al. Effectiveness of 2 doses of varicella vaccine in children. J Infect Dis. 2011;203(3):312-315. PMID: 21208922 www.ncbi.nlm.nih.gov/pubmed/21208922. Vrcek I, Choudhury E, Durairaj V. Herpes zoster ophthalmicus: a review for the internist. Am J Med. 2017;130(1):21-26. PMID: 27644149 www.ncbi.nlm.nih.gov/pubmed/27644149. Whitley RJ. Chickenpox and herpes zoster (varicella-zoster virus). In: Bennett JE, Dolin R, Blaser MJ, eds. Mandell, Douglas, and Bennett's Principles and Practice of Infectious Diseases, Updated Edition. 8th ed. Philadelphia, PA: Elsevier Saunders; 2015:chap 139. Winthrop KL, Baddley JW, Chen L, et al. Association between the initiation of anti-tumor necrosis factor therapy and the risk of herpes zoster. JAMA. 2013;309(9):887-895. PMID: 23462785 www.ncbi.nlm.nih.gov/pubmed/23462785. Zhang J, Xie F, Delzell E, et al. Association between vaccination for herpes zoster and risk of herpes zoster infection among older patients with selected immune-mediated diseases. JAMA. 2012;308(1):43-49. PMID: 22760290 www.ncbi.nlm.nih.gov/pubmed/22760290.